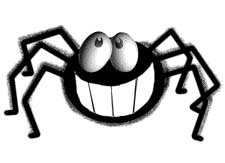 Summary: Everyone knows and loves the Itsy Bitsy Spider, but Iza Trapani has added new and lively verses to the song. 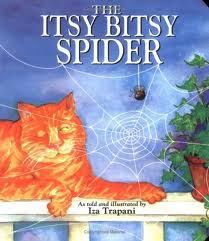 This all-new itsy bitsy spider has exciting encounters with a fan, a mouse, a rocking chair, and a cat. She finally makes her way to the top of a maple tree to spin her web. Cut about 16 slits around the edges of a paper plate. I prefer to use brightly colored plates such as orange or lime green. 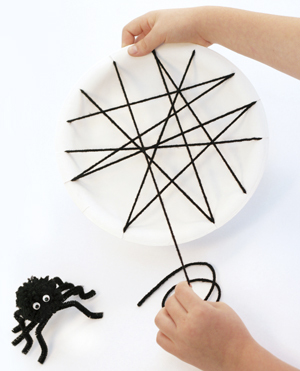 Tape a long piece of black yarn to the back of the plate. Then weave the yarn back and forth across the plate’s front to form a web. Tape down in back and accent the web with a spider!